The Dakotas, Part Two. 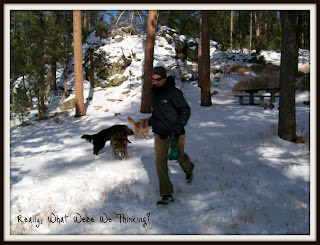 - Really, What Were We Thinking? Our epic cross country adventure starts here. Ok, so I forgot about the Badlands in South Dakota, but the previous post was long enough so I'll just include it here. I also forgot about one of the most memorable moments we had with the dogs on the trip. After the nice long day we had visiting Rushmore and Wind Cave National Park, we realized that the dogs really needed some time to run around. 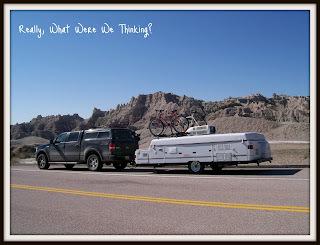 Dana had found a state park that was along the way back to the our campground in Rapid City. You are probably asking "how did she do that?" Well, by this point we figured that we needed internet in some form or another. I had only made reservations at campgrounds for a week or so out so, we needed some way to look up places other than calling our parents to look some up for us (which they did on a couple of occasions). We had very cheap cell phones but still internet capable so we bit the bullet and got it on my phone. It was slow with terrible graphics. But it worked. I digress. This state park, the name I don't remember, was off the highway and was only open for another hour by the time we got there. We parked the car in an area away from the main entrance road. No one was around. We, or should I say "I," am always a bit hesitant to let the dogs off leash. Rightly so. There have been several times where Boomer decided to pick another group of people to walk with and, well, Samson, if he finds something better, you can kiss his obedience skills right out the window. At this point, we didn't care. 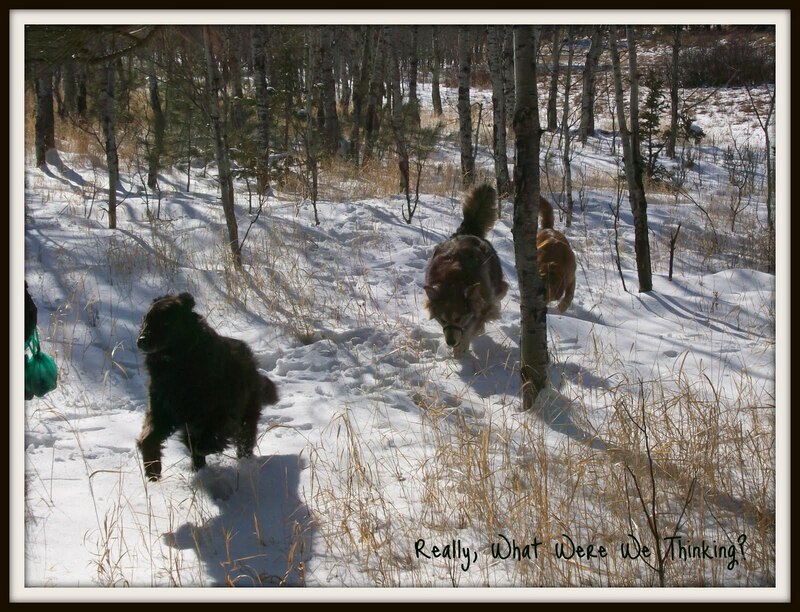 The dogs had been great and while I know that they enjoy riding in the truck, needed to expend some energy. We let them off the leashes and they took off. They ran around in the snow, chasing each other and chasing me, never venturing too far away from us. We didn't know it at the time, but this was one of the last times we saw our late Holly girl run. They were pooped and so were we. Hence, the reason we wanted someone else to cook for us that night. When we left Rapid City, our next stop for the night was Sioux City, SD, at the Sioux City North KOA, on the border of South Dakota, Iowa, and Nebraska (booooooo! Huskers). 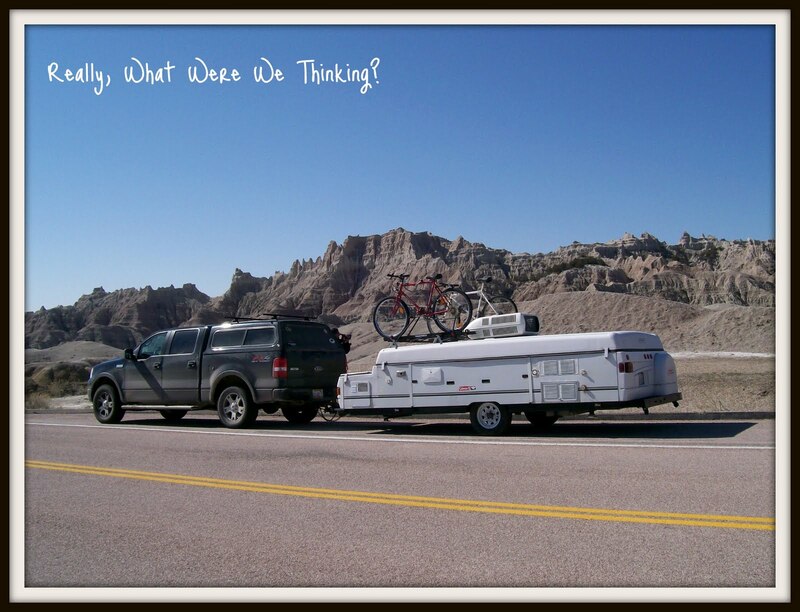 We were too close to the Badlands National Park to not go so we got off the interstate and drove a bit out of the way to visit. I remember this day vividly. There was not a cloud in the sky and it appeared that the temperature might even get over 40. If you have not been here let me tell you that this park is out in the middle of nowhere with it's majestic rock formations. It rocks; no pun intended. Ok, so maybe it was intended. 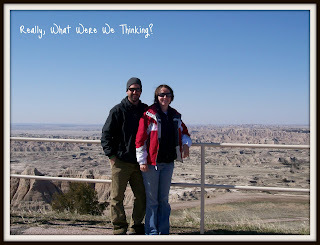 We spent most of the time just driving through the Badlands, pulling off at every major overlook. We even ran into a couple who was on the same tour at Wind Cave. Crazy, huh? I really wish we had had more time to explore but we had to get down track. Little did we know that as we drove to Sioux City, that we would drive past the exit for Wall Drug. In my 25 years on this planet, I have seen a few Wall Drug bumper stickers but never really knew anything about the place. Never really been curious either. Well, all along the interstate for hundreds of miles you see billboard signs counting down the mileage to Wall Drug, along with corny sayings. It's like South of the Border on I-95. We didn't go so I can't tell you how it was. Our KOA was fine and they had a nice fenced-in area where the dogs could pee and poop. By the time we got past the Badlands, I realized, and Dana hoped, that we had seen our last bit of snow. After all, it was mid-April. I also realized that we were at a point in the trip where most of the national parks were to our back. This was a sad realization for me. Don't get me wrong. I was still looking forward to the rest of the trip, but I was sad to go east.